I remember about 20 years ago when on holiday in the US, my husband invited me to an Italian restaurant. I love italian food and almost any kind of pasta. However my husband – a commited meat lover – was craving for someting in this category. 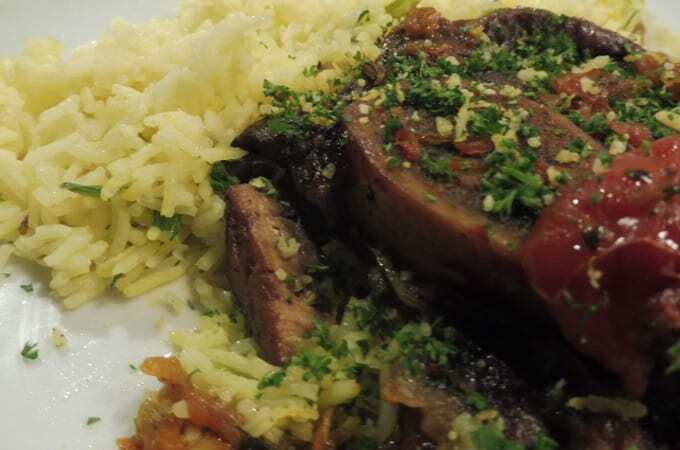 He decided to try osso buco, that time we had no idea what to expect. When it arrived he fell in love with that dish. Four years ago when in Milan, we ended up in the restaurant Trattoria della Pesa famous for their osso buco. 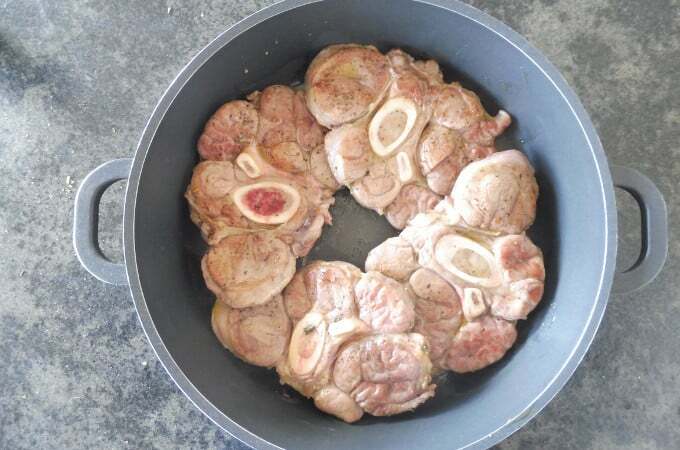 We had to book our seats well in advance to get the place, but it was worth it for the Osso Buco. 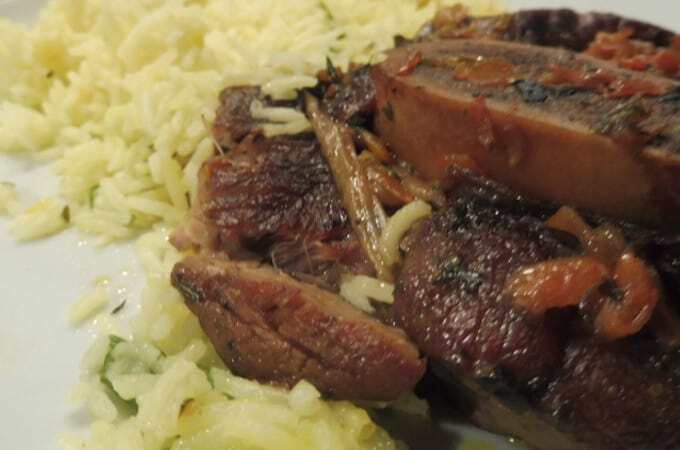 He also likes to prepare this dish at home and kept improving the recipe. 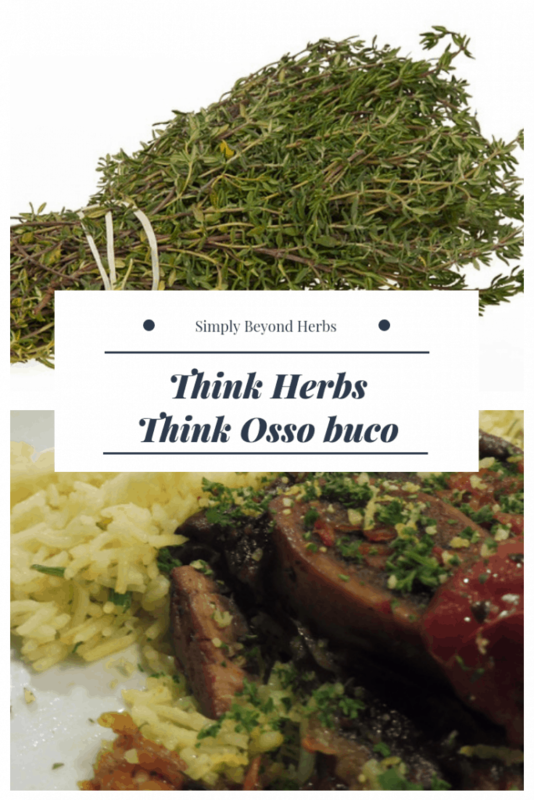 This is his latest version of Osso buco infused with thyme. The dish is finished with lemon zest and parsley, which stands for gremolata. in the large casserole heat the olive oil and fry the garlic first, than add the onion, carrots and celery. after 3 minutes of frying add thyme, season with freshly grained papper and salt. 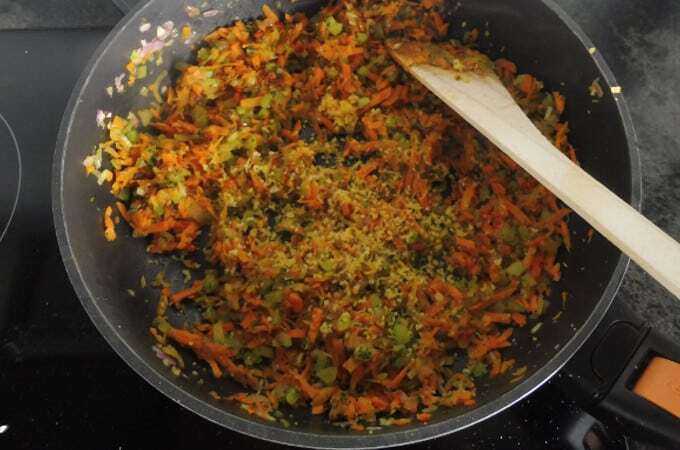 Once the liquid from vegetables is reduced, transfer the vegetable mixture on the side. Season the veal shanks with salt, pepper and thyme and cook over high heat until browned, about 2 minutes per side. 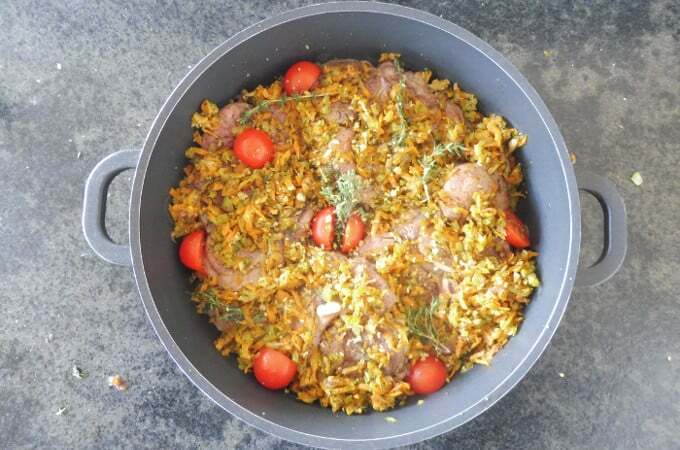 Pour the vegetable mixture over the meat in the casserole, add any accumulated juices and chicken stock. Place tomatoes on the top and sprinkle it with lemon zest. Cover the casserole and put in the oven. After 10 minutes reduce heat to 180 C and bake the shanks in the oven for 2 hour. Cut the spring onion into small pieces and fry it on 1 spoon of olive oil. Add rice, fry it a bit, add 600 ml of water and the saffron. Cover it and let it cook till water is absorbed and rice is ready. To prepare the gremolata you just mix chopped parsley with lemon zest. 5. To prepare the gremolata you just mix chopped parsley with lemon zest. Although I am vegan this looks absolutely fantastic! 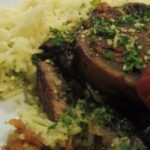 I love saffron rice, so I might just need to make some soon! Where do you get your saffron, it’s not always easy to find! Thank you Casey, I am lucky because my husband is once a year travelling to Iran and brings very good quality of saffron from there. This looks like such a delicious dinner! Love all the flavors here! Oh how I love this dish and the memories it brings back to me. I can’t wait to give it a try! This recipe looks really perfect. I have to try it this week. Thanks for posting it. 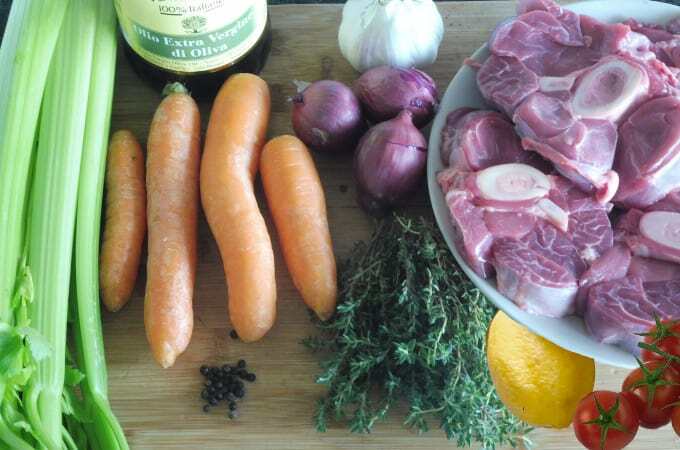 My husband is dying for me to make him some ossobuco! I might give it a go after seeing your post! This is perfect! Planning to make this for our Weekend dinner. Looks delicious and flavorful. Thanks for this recipe. 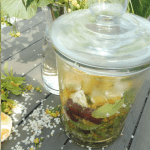 Herbs just give new dimension to ingredients and I love using them in cooking. The dish looks wonderful. I don’t think I’ve ever had a dish like this before but it certainly sounds delicious! Wow… this looks absolutely mouth watering. What a gorgeous meal! I love the lemon zest! it would make it oddly refreshing and flavored. that’s the final touch, very important!